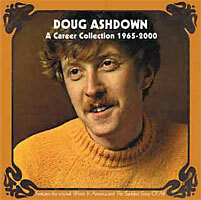 Few Australian recording careers can compare with that of singer / songwriter / guitarist DOUG ASHDOWN. Though most readily recognised for his sweeping, sumptuous 1970s hit ballad 'Winter In America', Ashdown began cutting albums in 1965 and can now claim a tally approaching 20 releases. Over almost 40 years of performing, writing and recording, Doug has covered myriad bases - always with absolute credibility and distinction. Amazingly, over all those years there has never been a Best Of, Greatest Hits or Anthology package of his impressive body of work. Raven's A Career Collection 1965-1990 serves to highlight his significant contribution to Australian music. It brings together his early folk tracks, his sumptuous ballads and his bluesy rags, from the original full length version of the striking 'The Saddest Song Of All', taken from the master of the legendary Age Of Mouse album, Australia's first double LP (sometimes cited as 'our Blonde On Blonde'), the stream-of-consciousness 'Something Strange' and the full, lush 'Winter In America'.